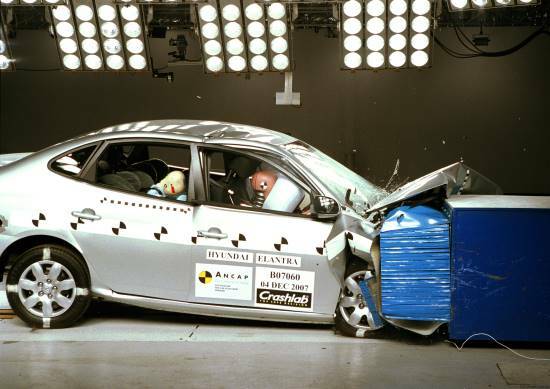 There are three main crash test rating agencies that we see in New Zealand: ANCAP (Australasian New Car Assessment Program), Euro NCAP and JNCAP (Japan). There is also the IIHS in the USA, but their figures don’t tend to be touted in New Zealand and they don’t give a straight star rating. ANCAP and Euro NCAP are essentially the same as the two agencies work together. JNCAP has different tests and speeds. The agencies give each car a score out of 5 (or 6 for JNCAP) and it measures the overall protection a car will give the occupants against head, neck, chest, abdomen, pelvis and leg injuries. Motorcycles and commercial vehicles aren’t tested. What do you need to know to choose the right car? Each car is given a rating out of 5. In general, the more stars the better. However, 5-star ratings given in 2007 are not the same as 5-star ratings given in 2014, and a 5-star rating on a large SUV is different to a small hatchback. You should always avoid vehicles that score 3 stars or less; you are twice as likely to die in a crash in a 1-star car than a 5-star car, and you will be more seriously injured in a non-fatal accident. Over time ANCAP and the other agencies introduce increasingly strict requirements to achieve a 5-star rating. At the moment a vehicle must have electronic stability control (ESC) to achieve 5 stars. In 2007 this wasn’t a requirement. While ESC doesn’t improve cabin strength, it does improve your ability to avoid an accident. Almost all pre-1999 cars are 3 stars are less according to today’s standards, even if they scored 5 stars then. In the future, other systems such as automatic braking may be compulsory to achieve a 5-star rating. From July 2014, the ANCAP badge includes the year tested to allow for a better comparison in the future. *From 2015 ANCAP is aligning its testing with Euro NCAP. ANCAP will still reassess the results and will release them as an ANCAP score, but they won’t necessarily have been tested in Australia. Car in the same class or category, e.g. SUV, medium car, etc, are tested together. This means that you can’t directly compare a large SUV with a small hatchback as the laws of physics are clear: a heavier vehicle will tend to have the advantage in a collision with a lighter vehicle. What you should be aware of, though, is that small vehicles are often safer in other situations. Smaller cars have less mass and can sometimes stop more quickly, which will mean any impact might be at a lower speed. Size doesn’t necessarily equate to greater strength in a pole test (see below) because if the doors are bigger the greater distance between two points of rigidity (e.g. the front pillar and the door pillar) the greater reinforcement that is required to achieve the same protection. First, pick a car that is suitable for your needs. If you live in the city and never go off-road or tow a large boat a station wagon will probably suit your needs better than an SUV if you have children; don’t feel that you need to have an SUV because it’s ‘safer’ as this is not always the case – you are at more risk of rollover accidents in an SUV as they don’t handle as well. How are crash tests conducted? A typical model of a car is subjected to four different crash tests and the results are measured using a crash test dummy. The dummy has an aluminium head covered in flesh-like rubber, and it contains three accelerometers to measure forces and accelerations on the brain. The neck contains devices that detect bending, shearing and tension forces as a result of the head being thrown around in the impact. The torso contains a set of steel ribs with measurement devices to detect the deflection of the rib cage during a frontal impact and whether injuries are likely. Loads and forces on the upper legs and hips are measured, as are shearing, bending and compression forces through the lower legs and knees. There are no sensors in the arms as serious arm injuries are uncommon, and passengers have very little control over them in an accident. The frontal offset crash simulates hitting the other vehicle with a combined speed of 64kph. This scenario can happen if a driver falls asleep and drifts across the centre line, misjudges a left-hand bend and runs wide, or fails to complete an overtaking move. The video below shows the test. The pedestrian test simulates where vulnerable parts of a pedestrian might hit a vehicle. The video below shows one of the tests. Where do crash tests fail? A 5-star rating doesn’t guarantee you will survive a crash, it merely defines the risk to the cars occupants at a specific speed in a specific type of impact. If you crash head-on into a truck and you are both doing 90kph, a five-star crash rating will give you more of a chance of survival, but that type of accident will be fairly unsurvivable in any car. Crash ratings can’t be compared across vehicles. This will always be impossible to do unless the rating are separated for each type of test, as explained above. And finally, crash test ratings can’t be compared between Euro NCAP/ANCAP vs JNCAP vs IIHS because the testing and scoring is too different. ‹ Bull bar rules in New Zealand – what is legal? Bull bar rules in New Zealand – what is legal?